"Siege of Petersburg: Fort Patrick Kelly, Constructed under the direction of N. Michler, Major of Engrs. USA, Acting Chief Engineer by Capt. B. F. Dexter, 50th N.Y. Vol. Engrs., Headquarters Army of the Potomac Engineer Department, September-October 1864." NARA RG77 Dr. 150-44. On Tuesday evening Captain Dexter reported Fort Patrick Kelly completed, except the abatis and some additional slashing in front and on the flanks of the fort. About two days more will be required with one company of engineer troops to complete the abatis and slashing. I am, colonel, very respectfully, your obedient servant, N. MICHLER, Major Engineers, Acting Chief Engineer. MAJOR: I have the honor to report that yesterday two guns of Roder's battery were placed in position in Fort Bross and two in Fort Patrick Kelly; two of Batteries C and I, Fifth U. S. Artillery, in Fort Blaisdell, and four of the Tenth Massachusetts Battery in Fort Stevenson. Nothing of importance has occurred on the line during the past twenty-four hours. 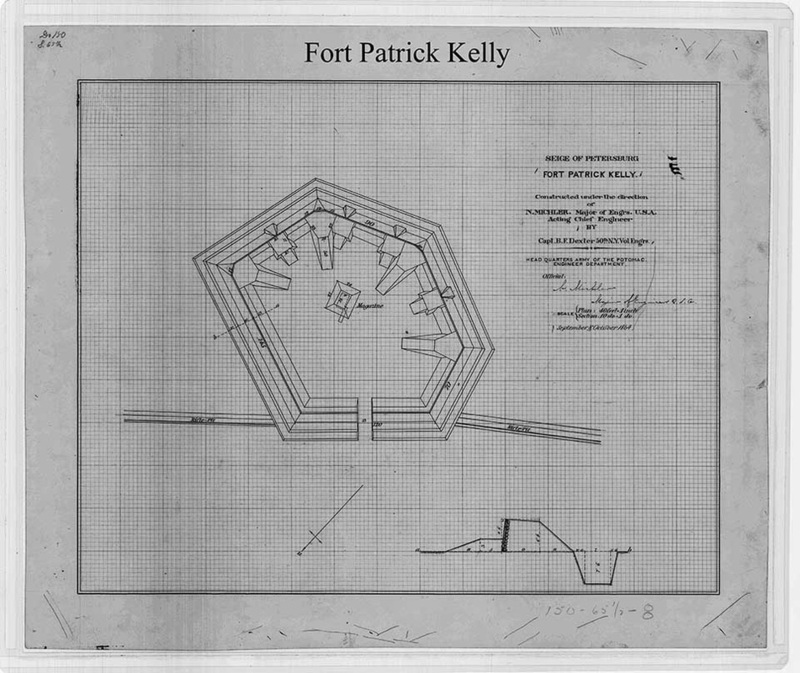 Plan of Fort Patrick Kelly reoriented with north at the top of the page. 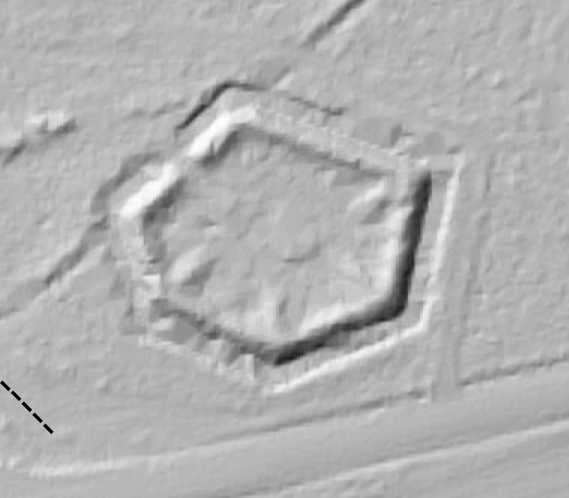 LIDAR image of Fort Patrick Kelly as it survives today. Contributed by Scott Williams. HEADQUARTERS ARMY OF THE POTOMAC, OFFICE OF THE CHIEF ENGINEER, February 27, 1865. For the past three days Lieutenant De Groot has been engaged with one company of this command, and for two days a detail of 400 men from the Ninth Corps, in completing the repairs of Fort Patrick Kelly. But little progress has been made today on account of infantry detail not reporting. The gun platforms are completed, and the parapets and drains nearly finished. J. C. DUANE, Major of Engineer and Brevet Colonel, U. S. Army. Detail from Michler-Weyss 8 in. = 1 mi. series, Sheet No. 4. NARA RG 77: G 204-34. Fort Blaisdell was built across the Jerusalem Plank Road. Fort Patrick Kelly was built on the Widow Smith farm. These forts were part of the rear-facing Union line.